Since all of these ‘gifts’ are manifestations of the Spirit, they are all supernatural in nature. God is a supernatural person, amen? Every single Apostle sent out carried the supernatural presence of God with them. That’s why everywhere they went miracles, signs and wonders popped off like popcorn. To this day anyone who calls themselves an ‘Apostle’ and doesn’t carry with them miracles, signs and wonders isn’t an Apostle – and there are tons of them out there so be careful. In 1 Corinthians 12, Paul establishes two very important guidelines for distribution of the gifts. These gifts then, are tools to be used by individuals, according to his gifting, for the good of all believers. The gifts are serious tools, not toys to be taken lightly. In examining 1 Corinthians 12, we can rather naturally group the Spiritual gifts into three distinct groups of three. Notice that Faith is the first gift mentioned in the category of Power. Faith is the supernatural foundation actively working in the believer, that enables healing and miracles to happen! In fact, Faith is the oxygen that fuels the fire of all of these gifts! You can’t pray for healing if you don’t accept that it’s already done! You certainly can’t step up and give a prophecy or Word of Knowledge without Faith. A corporate prophecy in tongues will definitely test your faith for an interpretation, from someone else or from you! This kind of Faith can only come from God Himself, not from you! This kind of Faith is part of God’s personality and nature! When we are anointed with this kind of Faith, the Holy Spirit actually imparts a portion of the Father’s faith in us. When we pray for healing we pray in Faith, knowing that the healing took place 2,000 years ago! Isaiah 53:5 and 1 Peter 2:24 tells us this very fact, “By His stripes you were healed!” Past tense! In Matthew 21:21, after cursing the fig tree, Jesus tells His disciples “Truly I say to you, if you have faith and do not doubt, you will not only do what has been done to the fig tree, but even if you say to this mountain, Be taken up and cast into the sea, it will be done.” This is a reiteration of what He told them in Matthew 17:20. But do you know what the mountain symbolizes? Throughout scripture the word ‘mountain’ either means an actual named physical mountain or it is a metaphor for Kingdom. In Revelation 13 and 17 when it speaks of seven mountains it is speaking of seven Kingdoms of the anti-Christ. The seven mountains are referred to in speaking about seven Kings. Do Kings rule over mountains? No, they rule over Kingdoms. So, if we have the gift of Faith, the supernaturalness of the Holy Spirit alive and working in us – we can move Kingdoms! In Mark 11:23 Jesus uses the word whoever “I say to you whoever says to this mountain “Be taken up and cast into the sea…” Doesn’t whoever mean anybody? Here Jesus is extending His promise to ALL believers! John 3:16 “…that whosoever believeth in Him…” Are you a whosoever? Yes, you are! Jesus puts no limit on this kind of Faith at all – we limit ourselves by our own unbelief. Jesus tells us that “whoever” can do anything. All that matters is the nature of his Faith and God imparts this faith to us in time of need. Jesus Himself promises us this in John 14:12-14 when He said “Truly, truly, I say to you, he who believes in Me, the works that I do, he will do also; and greater works than these he will do; because I go to the Father. 13 Whatever you ask in My name, that will I do, so that the Father may be glorified in the Son. 14 If you ask Me anything in My name, I will do it.” The question is Do you believe it?!? The first healing that I was ever involved with was my own. I had broken my back in 1999 and had herniated L4-L5 disks. For years, on and off, it had given me intense pain that I had to take narcotic pain meds for, just to get through a day. About a month after I made my prodigal return, on a Saturday night, I pulled my back out doing a simple every day task – and it was excruciating. When I got up to go to church the next morning it was all I could do to walk to the bathroom and get in the shower – what would normally take just a few seconds took about 10 minutes. As I stood in the shower crying in pain I remembered the words from John 14:12-14, that I had just read the day before. Funny how God can set up a situation for us to use His word :) As I stood there, letting the hot water run on my back, I declared these verses and I reminded the Lord that HE promised me this – that He would do anything if I believed and asked in His name – so I asked and claimed my healing in Jesus name. I turned around, turned off the water and stepped out of the shower. As soon as my second foot hit the floor I was instantly pain free. I did toe-touches to prove it to myself that it was gone - THAT is the power of God’s word being acted out in Faith! At that moment when I needed healing God imparted His faith into me and I was instantly, miraculously healed! Since then I have seen so many miraculous healings by simply calling down the power of God’s word by faith. I’ve seen spinal injuries healed instantly – one time there were five witnesses that actually heard a woman’s disk ‘pop’ back into place – confirmed by CAT scan. I’ve seen cataracts that had literally blinded a young man dissolve in front of my eyes. I’ve seen cancerous pancreatic tumors completely vanish overnight – confirmed by PET scan. There is power in the word of God – but we have to believe it and speak it with authority! 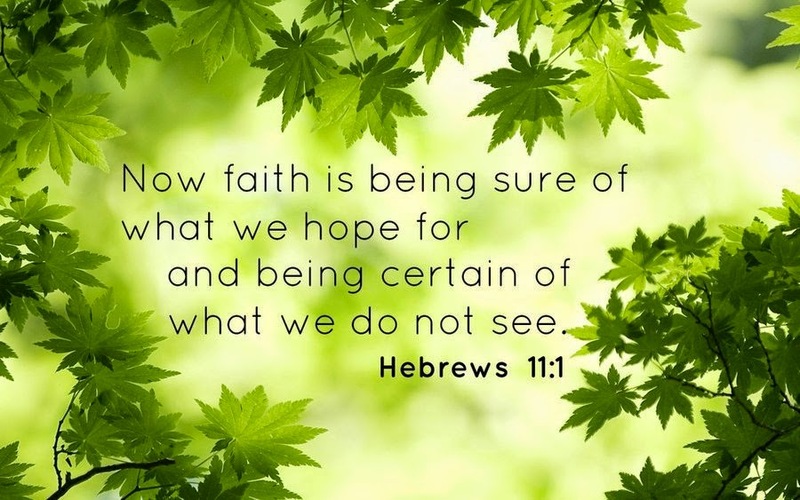 Remember the Hebrews 11:1 definition of faith, “the assurance of things hoped for, the conviction of things not seen.” We’re looking at one situation and it’s staring us right in the face – it’s real. We hope that it would be different, that what we are seeing would be transformed into a vision that we can only see in our minds – the “things not seen”. By way of the supernatural gift of faith we can say, “nuh uh, you be gone in the name of Jesus!” We still fall under the will of the Father, and His will trumps everything. This is where some of the other gifting comes into play – gifts like the word of knowledge, the prophetic word and discernment. You see the nine gifts of the Holy Spirit work in tandem; they work together for our good and the good of the body. But always remember, they are given at His discretion, according to the will of the Father. Matthew 17:14-18 tells us of the story of the epileptic boy who was healed by casting out a demonic spirit. The boy’s father told Jesus that he had first asked the disciples to heal his son, but they couldn’t, and after Jesus healed the boy the disciples asked why they were unable to do it. Jesus answered them saying that it was because of the “littleness of their faith.”He went on to explain that if they just had faith the size of s mustard seed that nothing would be impossible for them. Jesus uses the analogy of the mustard seed, the smallest of all seeds, to say that it is not the quantity but the quality of Faith that matters. This same scripture gives us a prime example of physical healing by way of Deliverance, or casting out demons. It is a different application of the same kind of faith. Deliverance calls for us to step up and take complete authority over the demonic. The result is the same – healing. It could be physical, psychological or Spiritual healing but it’s healing nonetheless. Do you know that the Bible makes no distinction between healing and deliverance? It’s true because the result is the same – healing. I’ve seen people totally liberated to the point of being like night and day, the difference before deliverance and after. Where there was anger or ill feelings before, peace resides. Where there was hurt before due to resentment or inferiority, confidence and joy reside. I’ve seen people wake from extended comas by casting out demonic spirits – while they were in the coma. The most amazing deliverance was my first. I was lead to a hospital by three ministers to pray for a dying woman. I had been fasting and praying for a few days at that point so I was a little loopy, so when I entered her room I thought she was just asleep. When I laid my hand on her head I knew different. She spoke to me – but it wasn’t her. It was a deep manly voice that told me to get my hands off of her. In that moment God imparted a word of knowledge that the woman was comatose due to a spirit of addiction that was killing her. After praying for a minute, I stepped up, commanded the spirit to leave and she was instantly awake, sitting up and talking to the people in the room. It wasn’t until four days later that I learned that she had been in a comatose state for three years! THAT is the power of God’s impartation being acted out in Faith! At that moment when I needed God’s help – and believe me I was a bit freaked out – the Father imparted His faith by the Holy Spirit and it was only then that I was able to take authority over the demonic and command it to be gone in Jesus name! Do you want to be healed today? There are three major stumbling blocks to having faith work in you – Doubt, Fear and Unforgiveness. · Doubt – Doubt can totally block faith from working. If you listen to the devil and begin to doubt or question the word of God about who you are and the power that you carry, you can actually block God from working through you. Doubt can go by different names like insecurity, lack of confidence, uncertainty or questioning – but the root of all of these is doubt. · Fear - In Luke 8:22-25 we find Jesus and the disciples crossing the Sea of Galilee in a violent storm. Jesus was asleep but the disciples were freaked out and woke Him up saying “Master, we are dying!”. Jesus rebukes the wind and seas and calms the storm. Afterward He rebukes the disciples saying “Where is your faith?” Jesus is saying “Why didn’t you handle this?” In other words, it would have been just as easy for the disciples to calm the storm as it was for Jesus – but in that moment of crisis, instead of standing on faith they buckled under fear! Fear blocked their faith from being able to work. Fear seizes and freezes the heart, closing it off to faith - but the love of Christ opens our hearts to all possibilities! · Unforgiveness – Matthew 6:15 tells us that “if you do not forgive others, then your Father will not forgive your transgressions.” And Mark 11:25 reiterates this warning: “Whenever you stand praying, forgive, if you have anything against anyone, so that your Father who is in heaven will also forgive you your transgressions.” I have come to the conclusion that unforgiveness is a huge block to getting prayers of any kind answered. Matthew 6:15 tells us point blank that forgiveness is a pre-requisite of salvation. If the Father doesn’t forgive you, then there is no salvation. When there is no forgiveness there can be no salvation! I made my prodigal return during a sermon on Matthew 6:15 and the second I forgave and asked Jesus in my heart everything exploded! Whenever I am called for an appointment for deliverance or a house cleaning, the only pre-requisite is that the person being delivered or owner of the house forgive anyone he or she has a grudge against. Otherwise we’re all wasting our time. John 11 tells the story of the raising of Lazarus from the dead. This is near the end of Jesus mission on earth and it happened in Bethany, which is still there today, about 1.5 miles east of Jerusalem, on the east side of the Mount of Olives. Lazarus was the brother of Mary and Martha of Bethany. Mary being the one who anointed Jesus with the perfume from the alabaster jar and Martha, the oldest of the sisters, had prepared the meal for Jesus and the disciples when they visited – this was at the same time as the anointing. Lazarus got sick and Jesus was summoned to the house. At the time that Jesus was informed of Lazarus’ illness He made the statement that “This sickness is not to end in death, but for the glory of God, so that the Son of God may be glorified by it.” How prophetic is that? He even hung out down by the Jordan river, where John the Baptist had baptized, about 28 miles away, for another two days before going to Bethany to see Lazarus. By the time Jesus arrived, Lazarus was dead and had been entombed for four days. God’s spoken word, energized by the Holy Spirit, was the acting agent in all creation. When the gift of Faith is operating by way of the Holy Spirit, man becomes the channel, he gets access to God’s own Faith. Jesus tells us in John 14:12 that we all have access to this power – in fact He tells us that everything He did, we will do also and even greater things. And I want to point out that it is not the person that is important, although some are anointed with great faith, it is the faith to step out and let the Holy Spirit speak through us that is important. God honors the stepping out. Scripture is clear, in Deuteronomy 11:13-17, that controlling weather, for example, is a divine prerogative but yet, in 1 Kings 17, Elijah held back rain for 3 ½ years! James 5:17 tells us that “Elijah was a man with a nature like ours”, meaning that he was just a man, like you and I, but by way of praying in God’s faith, he exercised God’s prerogative in stopping the rain and then he made it rain again! Do you want to be rain-makers?? I also know one local minister that did this exact same thing while in Oklahoma preaching. A huge storm came up with blinding rain and he had to get to the next town to preach. Finally he had had enough and got out of the car and rebuked the storm – and it stopped! “Truly, I say to you, he who believes in Me, the works that I do, he will do also; and greater works than these he will do” Do you believe it?!? James 5:15 tells us that “the prayer offered in faith will restore the one who is sick”. Does it say may restore the one who is sick? No. This is a good example of there being no doubt of the effect of the spoken word in prayer, when the gift of God’s Faith is exercised. Neither disease nor anything else that goes against God’s can stand. There is real power in declaring the word and will of God! Jesus spoke the fig tree to wither, the storm to calm, the spirit out of the boy and for Lazarus to ‘come forth’. In addition to spoken, or declared, Faith, the kind of faith that comes with the gift of Faith can be just as effective in unspoken ‘acts’. In Matthew 14:25-33 Jesus walks across the Sea of Galilee. He didn’t speak before doing this miracle, He just acted on Faith! To prove the point that Jesus makes in John 14, that everything He did we will do also, Peter then acts out on the same kind of Faith that Jesus had and also walked on the sea. It wasn’t until he lost his focus on Jesus and became fearful (full of fear) that faith left him and he sank. Jesus admonishes him in verse 31 saying, “You of little faith, why did you doubt?” Note that Jesus didn’t reprove Peter for attempting to walk on water; He reproved him for losing focus and letting in fear that caused him to lose his faith half way through the act! KEY POINT: God does not get angry at us for trying to walk on a plane higher than our natural ability, He rebukes us for not holding on to the faith it takes to accomplish it! Further, when supernatural Faith is given for a specific task it remains in God’s control – because it is His to begin with; He merely loans it out to us at His discretion. This is exactly why some folks get healed and some folks don’t. I hate to use a worn out cliché but it is still God’s will that has the final say. Supernatural Faith is just like any of the other eight supernatural gifting. This is why Paul says in 1 Corinthians 12:11 “But one and the same Spirit works all these things, distributing to each one individually just as He wills.” The key words in that line is “just as He wills”. God determines not only to whom He endows with power through the gifts but also when He will act. The initiative is God’s, not mans. We have to learn to listen and be sensitive to the will of the Father. The gift of Faith is not ours to command but is made available to us at God’s discretion to use to accomplish tasks that are according to His will and purpose. In situations that require supernatural faith, more than we have on our own conviction, God provides the mustard seed.